This book focuses on the money of Eastern Central Asia to c. AD 800, a period of over 900 years, across a vast geographical area with a very diverse population of different cultures and traditions. The only relevant historical accounts are those found in the Chinese dynastic histories, yet these contain few references to money in Eastern Central Asia. This study therefore depends almost entirely on the archaeological evidence for money found at sites in the region, in the form of coins and contemporary documentary evidence. The book is arranged in four parts. 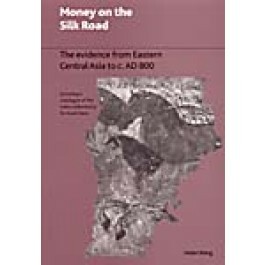 The first part presents the background to the study, the second the numismatic evidence, the third gives the evidence for money in the contemporary documents excavated at sites in Eastern Central Asia, and the concluding part brings together the data from the numismatic and documentary evidence to create a new framework for money in early Eastern Central Asia. Part 1. Background, sources and the approach. The Silk Road and Eastern Central Asia; Money on the Silk Road. Part 2. The numismatic evidence. The Stein collection of coins from Eastern Central Asia; Coins of the Chinese tradition; Coins of the Western tradition; Coins of local manufacture. Part 3. The documentary evidence. Chinese documents: wood slips (1st century BC-4th centuries AD); Kharoshthi documents (3rd-4th centuries); Chinese documents: paper documents (4th-8th centuries); Khotanese documents (7th-8th centuries); Tibetan documents (8th-9th centuries). Part 4. Conclusion. Money in Eastern Central Asia to c. AD 800: a new framework. Plates; Maps; Bibliography; Appendix; Index.